At first it seemed so and Coade and Sealy went from strength to strength but by 1833 the business went bust. What went wrong? Read on to find out what happened to destroy Eleanor’s Coade’s enterprise and take down such an iconic name. Coade Stone factory yard on Narrow Wall Street, Lambeth, London, c1800. John Sealy had worked for the company before being taken into partnership. But very little seems to be known about him. Even Alison Kelly’s compendious “Mrs Coade’s Stone” only gives him a handful of mentions despite this being a highpoint in the company’s history. Nevertheless what we do know is impressive. He seems to have been an able manager and was also apparently a skilled modeller, working alongside another sculptor Joseph Panzetta on new designs and grand projects. Sealy must have had an eye for marketing too. He rewrote the short guidebook to the company’s exhibition gallery at the end of Westminster Bridge. It became a 38 page version entitled Description of Ornamental Stone in the gallery of Coade and Sealy which described the contents of the exhibition space room by room, and although it is not illustrated the descriptions are lengthy and detailed, sometimes including references to sites where the item might be seen in situ, and sometimes mentioning prices. Of course many, if not most of the designs were those of John Bacon and some had been illustrated in his book of etchings. Sealy certainly gained receiving a large number of prestigious commissions for public statues. In 1809 for example a memorial column crowned with a statue of Admiral Nelson, was sent out to Montreal. There was also a magnificent relief in the form of a tympanum installed at the Royal Naval Hospital in Greenwich. Sculpted by Panzetta to a design by Benjamin West it is over 40 feet long and up to 10 ft high and shows the extraordinary technical skills of the craftsmen in the Lambeth works. 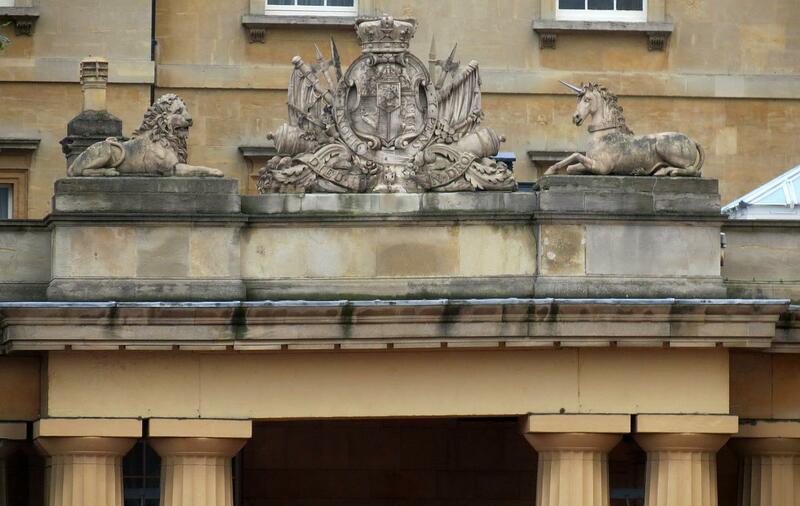 Coade and Sealy were also able to capitalise on the the Golden Jubilee of George III in 1810. It was celebrated with statues going up all over the country, including several by Coade and Sealy. Sealy himself is thought to have modelled the famous one at Weymouth [Richard Phillips, Picture of London, 1804]. Others were erected in Lincoln and Bristol. John Sealy died in 1813 and was buried in what is now the grounds of the Garden Museum in Lambeth just along the river from the factory. His tomb is topped with an ovoid Coadestone urn with a snake curling around it. This is probably an Ouroboros- a serpent (or sometimes dragon) devouring its own tail which symbolizes the continuity of life. Nearby, under another Coade monument, this time a chest tomb surmounted by a flaming urn is Admiral William Bligh of breadfruit and Bounty fame. Sealy’s tomb has flaked badly – proof perhaps that even Coadstone isn’t a total guarantee against decay and erosion- or perhaps suggesting that there must have been at least the occasional misfiring. Eleanor was partnerless once more. Sealy had left a son, another John, who had been to the Royal Academy School and was probably working at the factory but he was almost certainly too young and inexperienced to take on as an equal, although she may have planned to do that eventually. Instead, she turned to another distant relation, William Croggon, who had been an auctioneer, making him manager rather than a full partner. Sadly young John died in 1818 so we’ll never know if he was talented enough, and what Eleanor’s plans were. The business reverted back to being called just Coade although Eleanor herself seems to have retired from active participation in running the company soon after Croggan was in post. In a surprising turn of events three of Croggon’s business books for the years between 1813, when he took over management, and 1821, when Eleanor finally died, have survived and are now in the National Archives. They were called in as evidence by the Court of Chancery when Croggon became involved in a dispute between Eleanor’s heirs and for some reason were never reclaimed. They were ‘rediscovered’ in the 1960s and formed the basis of an article by John Ruch in Architectural History in 1968. Croggon’s accounts show that superficially everything was still going well. The factory had never needed a large workforce – just 15 in 1813 but by 1821 Croggon had taken on 6 or 7 more to meet rising demand. He shut the gallery at Westminster but opened a new showroom at the Lambeth factory which he enlarged substantially and gave a grand facade. Business boomed and prestigious commissions continued to arrive. For example, in the 1820s the factory supplied vases for the terraces of Buckingham Palace, and seven statues for the entrances there as well as a massive relief for the garden front and architectural detailing for the central quadrangle. This brought in a huge amount of money – Alison Kelly says nearly £11,000 in total between 1826 and 1828. There were orders from at least 150 architects including many of the greatest of the day amongst them Sir John Soane and John Nash, both of whom used Coade figures on their own house frontages, as well as Samuel Pepys Cockerell, James Wyatt and William Wilkins. A fuller list can be found in Alison Kelly’s Mrs Coade’s Stone, whilst her list of sites with Coade features stretches to about 70 pages. The factory continued to make mainly classical designs, but the order book included Greek Revival ornaments for Deepdene and Downing College, a large number of Gothick designs, Egyptian style pieces for Bullock’s Museum on Piccadilly, the Egyptian House in Penzance, and Buscot and even Indian designs for Sezincote and Coleorton. with the temple to Surya, the Hindu sun-god, designed by Thomas Daniell. The plaque is by Coade, c.1814. © Copyright Philip Halling 2015 and licensed for reuse under this Creative Commons Licence. Work was exported all over the empire with pieces being sent to the Caribbean, Canada, India and Sri Lanka, South Africa and Gibraltar. It went east to Russia and Poland, and west to the United States and even Haiti. This last was apparently a speculative venture by Croggon who sent a small shipment of animals and figures worth about £40 in the hope of orders. He might have been surprised what happened to one of them! Croggon also diversified production and from 1817 began turning out pieces of scagliola – or imitation marble made largely from plaster – which was once again becoming very fashionable for impressive interiors. When Eleanor Coade finally died at her home in Camberwell in 1821, she did not leave the business to Croggon, and he had to buy it from her heirs. He also acted as agent for her executors, selling her house and the properties she had built near Westminster Bridge, including the gallery. He then bought the company from her heirs and ran the business under his own name, although since the two sides ended up in the Court of Chancery something must have gone wrong somewhere along the line. There is a lengthy article about a visit to the factory made in 1824 which gives no hint of any problems. The author was taken round by Croggon himself “with perfect politeness” and he explains in detail the various processes and products. In 1828 he renewed the lease on the factory for another nine and half years. Yet perhaps there was something underneath already going wrong because Croggon was declared bankrupt on 31st December 1833. You will see that by then Croggon had diversified even further, and seems to have opened or bought a wooden letter manufactory on Fleet Street – although I have been able to find nothing else about this. Anyway, most writers about Coade and Coade stone find his bankruptcy hard to explain. They argue that either Croggon’s market was undermined when cement-based artificial stone appeared on the market, because it substantially reduced production costs or they follow the line taken by Alison Kelly, Coade’s biographer. She suggests that Croggon suffered a major cash flow problem when the Duke of York died in 1827 leaving debts of over £200,000 for a new house and its fittings, but no money to pay them. Croggon had certainly been asked to supply a large number of sizeable scagliola columns and was not paid nor could he find another wealthy client to take them off his hands. Would this have been sufficient to break such a successful enterprise? It probably did not help that Croggon had also just opened another showroom on what is now Euston Road near the junction with Tottenham Court Road, much closer to the fashionable housing developments taking place in Marylebone and the other northern and western suburbs. This probably also incurred substantial costs. It also, incidentally, attracted rival manufacturers and in 1827 Felix Austin [about whom more in another post soon] opened his factory and showroom just down the road. However Croggon must have found another partner because only a couple of months later he wrote to Sir John Soane, who had been a major customer of the Coade factory, telling him that ‘having formed a partnership with a gentleman who has purchased all the stock, plant, machinery and effects, the business in all its branches is resumed under the firm of William Croggon and Company … at Lambeth’. It made no difference. A sale of the factory’s surplus stock took place on 30 July 1834. Croggon died soon afterwards and his son, Thomas, took over the lease on the factory. There are a few pieces which bear his mark but his management only lasted until 1837 when the lease was turned over to Danforth & his new business partner, Thomas Routledge. Together they ran the terracotta and scagliola works making more mundane things like tiles, but also producing small numbers of Coade stone ornaments until 1840. But they couldn’t make it pay either and the factory closed. Amongst the last pieces to have been produced was the famous lion that stands at the end of Westminster Bridge in London, which is dated 1837. Although it is stamped ‘COADES’ on its paw, a bottle containing the trade card of Routledge & Greenwood was found in a cavity in its back during conservation work. Later still was the charity boy at Vintners’ Hall which is marked ‘COADE’S 1840’ (87). The factory’s moulds were finally auctioned off in 1843 and that, as they say, was that! Except that of course it wasn’t because some of the moulds were bought by people who decided to use them… so more about some of the heirs to Eleanor’s empire in next week’s post. This entry was posted in Uncategorized and tagged cemeteries, Coade, John Bacon, john nash, john sealy, Sir John Soane, statues, willaim croggan. Bookmark the permalink.